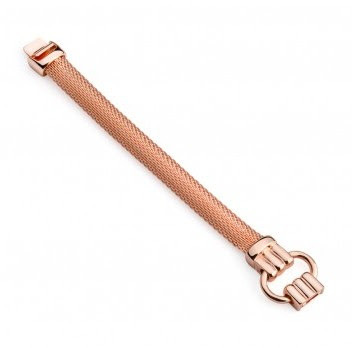 Show off your love for fashion with this rose gold wrist adornment. 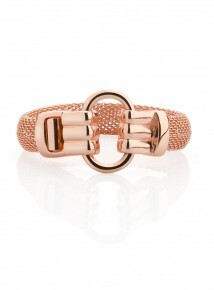 A modern take on the sign language gesture for lover, this mesh bracelet features an O-ring and two hand shaped buckles. Our 7 ¼” piece fastens with a box clasp for a seamless look. Slip on this bracelet as a symbol of your everlasting affection for all things chic. 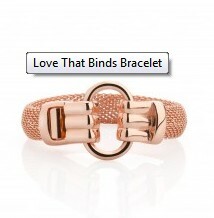 This rose gold "Love That Binds" bracelet has been on my wishlist for quite some time. I love the classic look and feel of the bracelet and to me it just screams elegance. Well, I had already purchased my JewelMint selection for the month of August but I really loved this bracelet. So much so that I went ahead and made another order for August. If you are not familiar with JewelMint and the whole process you can read my earlier post about it here. Or click on this referral link to sign up right now. Anyway, I purchased the bracelet at the end of August. I know, I know, I could have used it as my September purchase but I really wanted it and I'm not a very patient person either! Ha Ha! Seeing as how I already had my heart set on this piece, I placed the order later that evening after making sure it was still in stock. However, silly me, forgot about having to go out of town the week that the bracelet was suppose to ship and deliver. So I asked a neighbor to keep an eye out for the package. The end of my trip couldn't get here fast enough. I was so excited to try it on. It felt like it was my birthday or Christmas! Oh my, the bracelet was so gorgeous. It was everything that I imagined except for it being broken and to small. LOL. I have to laugh because I was so over the moon about this bracelet and here it is and I can't even wear it. Oh, how disappointing! I was utterly heartbroken. What was I going to do? Will they accept returns? Can I even return it? The next day I contacted Customer Service at JewelMint and explained my situation. The Customer Service Rep. that I spoke with was extremely friendly and very helpful. She explained that all original packaging had to be returned along with the broken bracelet. I could choose to receive a replacement bracelet or they would issue a credit to my account once they had received the bracelet back. Oh, and you mustn't have worn the jewelry either; which I hadn't, so no problems there. I opted for the later, and asked for my account to be credited seeing as how the bracelet was too small anyway, which I'm still a little disappointed about. Even though this purchase didn't turn out the way that I expected it too, I consider it to be a success and I will continue to recommend JewelMint to both my friends and family. I would love to hear from any of you that have ordered from JewelMint and how your experience was with them. Did you have any problems? Did you receive the same excellent Customer service that I did with my purchase? Please share your story with us.